President Donald Trump harshly criticized Germany on July 11 for buying vast amounts of energy from Russia while relying on the United States to deter the threat of Moscow’s threatening geopolitical ambitions. 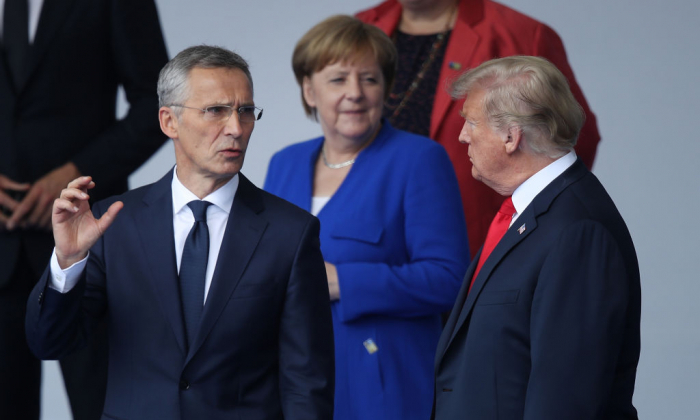 Trump aired his criticism in a tense exchange with NATO Secretary General Jens Stoltenberg as cameras rolled during a pre-breakfast media opportunity usually reserved for pale and formulaic political remarks. “Well, I have to say, I think it’s very sad when Germany makes a massive oil and gas deal with Russia, where you’re supposed to be guarding against Russia, and Germany goes out and pays billions and billions of dollars a year to Russia,” Trump said. Although Trump did not name the Russian pipeline project, he was referring to Nord Stream 2, an expansion of the world’s largest undersea pipeline linking Russia to Germany. Russian state-owned gas company Gazprom owns the majority stake in the project, with half of the financing coming from a group of energy corporations from France, Austria, England, and Germany. The United States has long opposed Nord Stream 2, saying it would undermine Europe’s security. In May, the State Department threatened to sanction the companies involved in the project. Stoltenberg defended the Russian pipeline, saying that even during the Cold War some allies traded with Russia. Jens Mueller, a spokesperson for Nord Stream 2, told The Epoch Times that Nord Stream 2 is a commercial project with five investors in the EU. Roughly half of the pipeline’s $9.5 billion price tag is financed by Germany’s Uniper and Wintershall, France’s Engie, Austria’s OMV, and Dutch-British oil giant Royal Dutch Shell. The threat of an emergent Russia was expected to be the key theme at the summit. In bringing to light Germany’s energy dependence on Moscow, Trump affirmed the assessments from his State Department, which has for months warned that Nord Stream 2 is a threat to the national security of America’s European allies. Trump also established America’s position on Nord Stream 2 ahead of his meeting with Russian President Vladimir Putin on July 16. The European Union is split on the pipeline issue. Germany and a handful of dominant union members support it. Nord Stream 2 largely follows the route of the existing Nordstream pipeline. Gazprom secured permits from Finland, Sweden, Denmark, and Germany to build the pipeline on the bed of the Baltic Sea. Meanwhile, many smaller central and Eastern European members of the EU oppose the project, fearing that the pipeline would establish Russia’s dominance over the European gas market and free Moscow from funding a lucrative deal for Ukraine as a transit country. Nord Stream 2 has been viewed as an intensely political project since Russia invaded Ukraine and annexed Crimea. Half of the gas that Gazprom sells to the European Union transits through Ukraine. “Russia currently has the ability to supply gas to Europe across Ukraine. So adding Nord Stream 2 is not adding a new capability of supplying gas that doesn’t exist,” Kurt Volcker, the U.S. special representative for Ukraine negotiations, said on May 24. On July 9, the president of Ukraine and the presidents of the European Council and the European Commission opposed the Nord Stream 2 pipeline in a joint statement. Trump’s pressure on NATO allies to increase military spending has so far worked. The president said that allies increased spending by $40 billion at his urging. But the figure is far short of what Trump demanded, with only a handful of the allies meeting their commitment. Trump imposed the tariffs in response to years of unfair trade practices and intellectual property theft by the communist regime.